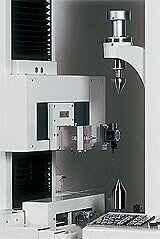 At OSK, various modern CNC controlled equipment is used to perform ultra-precision machining. However, the processing accuracy of the surface grinding machine is about 0.003mm. On the other hand, the necessary accuracy of the sliding surface of the measuring instruments is ±0.001mm. But at OSK a manual process called "scraping" has been performed by experienced workman, and the required accuracy is achieved. Scraping is a processing method in which a manual tool, like a flat surfaced chisel, is used to flatten the sliding surface to achieve an ultra-high precision plane. 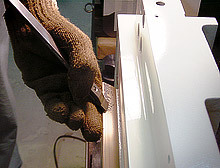 The sliding surface is rubbed against a fixed board (master) painted with a marking compound to make contact pattern. Then the protruding area of the sliding surface is marked. "Scraping" is repeated on the marked area of the surface until the desired surface is obtained. Actually, there exists small waviness on the sliding surface after the scraping is done. The peak areas of the sliding surface have same height and the valley areas make an hallow of about 0.001mm through out the sliding surface. These hollow areas are occupied with lubricant and helps in preventing the surface ware caused by the friction. This is one of the techniques that could not be achieve by machining, whose surface is too flat. To assure the quality, the finished surface is checked using micro-Indicator with 0.0002 mm resolution. The delicate work of eliminating the error of more than 0.001mm is achieved by the highly skilled workmen selected as "Contemporary Expert Artisan". Once the measurement data are obtained, next question is how to judge the result and how to utilize those data. And, the personal computer is essential and software becomes highly important for data processing. OSK had developed CNC controlled gear measuring instruments earlier than anyone else, and since then we have been developing many kinds of software. Software plays a major role to support the measurement of the large variety of gears and cutting tools, and also the output data for and diverse measuring concepts of each customers. The an easy to use, accurate and fast processing data analysis system was developed. Those measured result also can be transferred and controlled through through network systems. OSK offers a easy use and high performance technology throughout the operation starting form the input till the final output. Gears are used as important parts necessary for the transmission of power in automobiles, airplanes, cameras etc. In the recent years, along with the development of high-quality products there exists a demand for the gears with high-performance, such as low noise & vibration, etc. In order to produce these high-performance gears, the instrument that can measure those gears more precisely is required. OSK is continuously working on the research anddevelopmentof the gear measuring instruments in cooperation with research laboratories of various universities and industry associations. Further, OSK cooperates in executing research and development projects to establish the evaluation methods, for the high-precision testing of geometrical shape and size of the gears and propose them as the international standards. Continuous effort is made to make high-quality products aiming at high-precision measurement.